Mid-week check-in at ROW 80 seems to roll along so quickly, yet I have made progress. Here are my goals for this round with what I’ve done in bold. Take courses. Attended a webinar this afternoon on pb submissions. Read at least 3 books on the craft of writing as well as articles online. Read “Take Joy” by Jane Yolen. 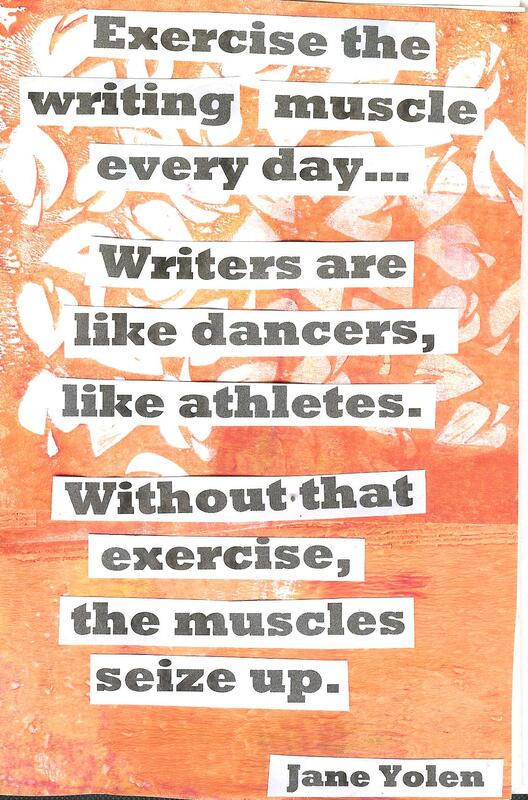 So many great nuggets on writing. Read articles. Finish the first draft of “Catching Love” –finished part of another chapter. Write at least one picture book a month Worked on picture book ideas and fleshed out ideas for a new story. Take part in Write1Sub1 and 12 X 12 . Finished revisions on story for Highlights. The challenge here is to use the date and share some part of your WIP based on the date. Toady is January 28, 2015. 1 + 28 = 29 so page 29, 15 lines for you to read. The kiss is all over the internet and Emma has been put on leave from her teaching job. “So you haven’t lost your job yet?” Flynn inquired. Emma put her hands to her face. “I’m the one who got us into this unholy situation.” Flynn took her hands away from her face. Slice of Life Tuesday is a writing challenge to share a slice of your life with a very supportive community at “Two Writing Teachers”. Today was yet another visit to the doctor along with a breathing test for my husband. Several times a month, there are more test and more visits with different doctors. Yet little is done to relieve his pain. As I was waiting, this response came and I wrote away. Time for our Sunday check-in for ROW80 – the place to share one’s progress, challenges and receive support. The past few days have been a roller coaster.I received an offer of a contract on Wednesday with AnaiahPress for a novella I submitted during the #JustPitchit twitter party (for faith-based novels). But then when seeking advice, was told I should have an agent and was offered help, but still waiting for advice. I am not sure what to do, having never been in this situation. I will need extensive revision as they want a full novel (30,00 words). Has anyone dealt with Anaiah Press; had a contract offered on their own? I have made some progress the past few days, but not as much as I would have liked. I don’t know if I mentioned the fall I had Wednesday morning, but there are still lasting effects – a bit of a headache, muscle aches and stiffness. I literally had no chance to break the fall and fell flat on my back, hitting my head. I did end up complaining to the town about the ice build-up on the sidewalk but I still see it there. I feel like an old person – not wanting to go out in case I fall! Here are my goals and what I accomplished/or not this week, in bold. Take courses. Haven’t started a review of previous courses yet. 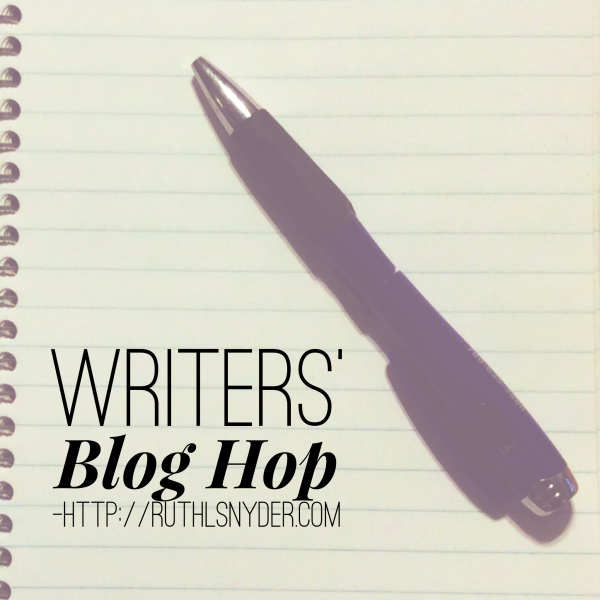 It is Week 2 of the Writers’ Blog Hop, hosted by Ruth Snyder. I am currently working on a contemporary romance (which I have been sharing at WIPpet) and a middle grade novel. I have several other projects on the go, but I have put them on the back burner while I concentrate on these two. Here is a snippet of “Jack’s Summer”, my middle grade novel. “Sheila, you and I will stay in the car. Daddy and Jack will be just a few minutes.” The wife spoke again to his sister. Lying to her really. He would be gone for longer than a few minutes. He didn’t want to upset his sister so he got out of the car. His dad had already got his suitcase and backpack from the trunk and placed them on the ground. “Hi Ted. This must be your boy. He’s tall for 13.” The man held out his hand for his dad to shake. “Yeah, he takes after me I guess. It’s great that you’re willing to take Jack for the summer, while we’re away. I know he will be a big help to you. Here’s something to help with his food and boarding.” His dad handed the man an envelope, which he put in his coverall pocket. Now both of them looked at him. He wouldn’t be fine. He didn’t want to stay here, but his dad never listened to him anymore. It was all her. “Well son, we’d better go and leave you to settle in. I’ll call you in a day or two. Take care of yourself.” His dad patted him on the shoulder, then turned and went back to the car. The engine started and then it was pulling away. He could hear Sheila call his name again and again. Jack watched as the car pulled away, dust being kicked up as it picked up speed. .No, he would not cry. Sheila could cry but he would not. He could still hear her screams from the car. He bent down and picked up a stone. He tossed it in the air and caught it. He wanted to hurl it at the car as it drove down the long driveway. He hated her. Hated her for taking his dad and sister away. Hated her for leaving him here. Hated her for the beatings. But he dropped the stone before he actually threw it. What good would it do anyway? He was stuck here for the summer. Here is my progress for the past few days – in bold. Be sure to check here for all ROW80 participants – an excellent supportive team! I have just recently started taking part in this challenge – to post a snippet from a WIP, based on the date. “Flynn, it’s Emma. You know, you and I met at the bar last night. Well, I just got photographed when I tried to leave my place not ten minutes ago. What am I supposed to do now?” She felt like throwing the phone and screaming. How had her life changed so much in such a short time? Flynn was talking with his brother when his phone beeped. He ignored the call. If only his brother learned to solve his own problems, he wouldn’t have been at the bar and there would have been no photo. But to be perfectly honest with himself, he was not sorry he had met Emma. There was something vulnerable about her that caused him to want to help her. “Okay Pete. Just forget it. See you next week.” He hung up on his younger brother. His anger was still simmering and talking with Pete hadn’t helped. He checked the numbers called and saw a number he didn’t recognize. As he played the message, he heard Emma’s voice. Of course he remembered her. How could he forget her? Now they were beginning to harass her. This had to stop. As he ran his fingers through his hair, he pressed call and waited for her to answer. “Emma, I just got your message. I seem to be having to apologize to you a lot. But I am sorry.” He drummed his fingers on the table. “What do I do Flynn? I have to go to school tomorrow. I can’t have this going on.” Flynn heard a tremor in her voice. “Do you think it will work?” Emma sounded hopeful. 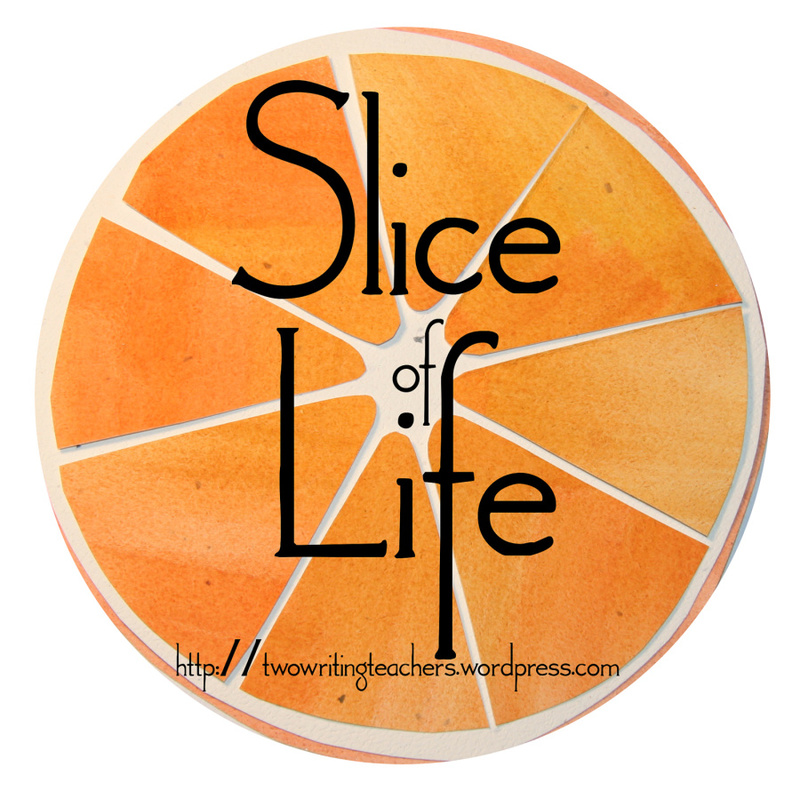 Today it is time to share our slice of life for the challenge at “Two Writing Teachers”. I came across a quote by Neil Gaiman which has stuck with me and resonates deeply. “I hope that in this year to come, you make mistakes. 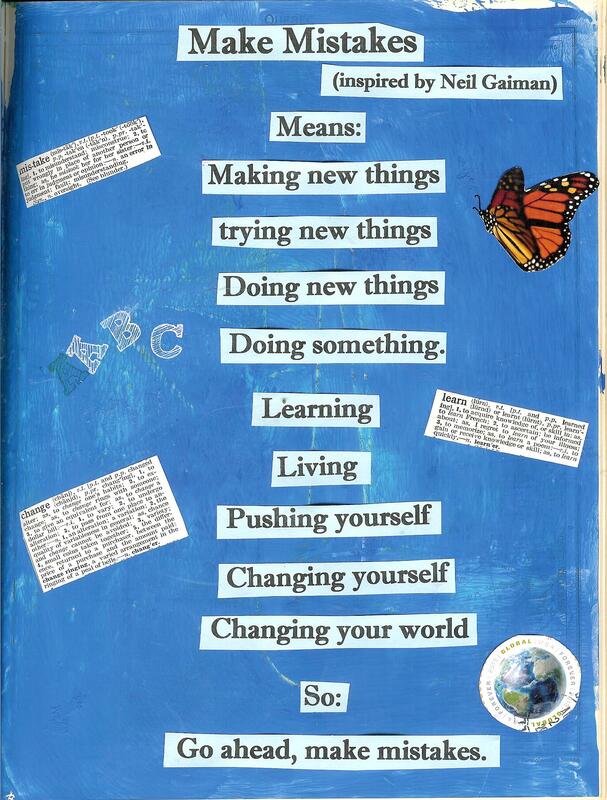 Because if you are making mistakes, then you are making new things, trying new things, learning, living, pushing yourself, changing yourself, changing your world. You’re doing things you’ve never done before, and more importantly, you’re Doing Something. It lent itself to the creation of this poem and then an art piece. What a wonderful mantra to follow for 2015. Especially as my word of the year is “Bloom! No matter our age, we can all still learn and grow. I want to take these words to heart and make lots of mistakes this year and relish in them. Time to share the progress on our goals for ROW80. On Jan. 5 I took part in the #JustPitchIt twitter party and had my novella favourited. Then this past Thursday, I had a request to send the full manuscript. This has been the first time I have had a full request. After writing about my doubts about my writing on Wednesday – this was quite a boost. Nothing may come of it, but someone was interested in reading more. Another big boost was just the outreaching from this community. Thanks to all who definitely helped with their words and caring. Time for our mid week check-in at ROW80. I have included my goals, and in bold included my progress. Continue to read good articles on writing online. 1. I read a novel by Bella Andre (who I enjoy reading) and then compared my current romance novel to hers. A huge no-no. Needless to say, today I did not get much writing in . I’ve let others’ opinions worm their way into my mind and make me doubt my writing ability. But – (and this is why I’m in ROW80), I knew that I must write and report on that writing. It is only a first draft for the romance. And revisions are always made. So enough pity party and get on with what I enjoy doing. Banging on her door startled her. How could anyone get up here without going through security? She moved to the door and looked through the peephole, Flynn stood there, angry again. Against her better judgement, she closed the door, undid the chain and then let him in. Flynn walked into the living room and then turned to face her. She looked down at herself. Was that really her looking up at Flynn, seeming to be flirting with him? 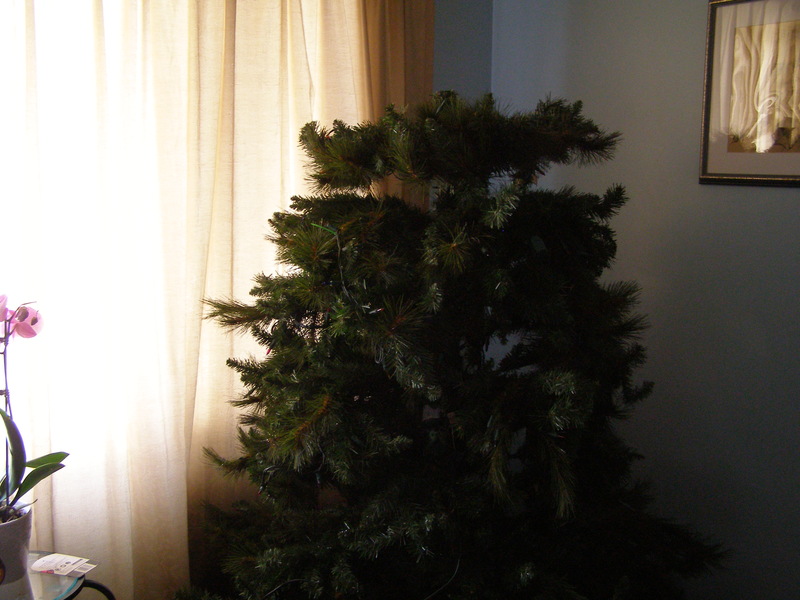 Our Christmas tree is finally down, ornaments packed away. This has been the longest it has remained up. We keep it decorated and lit until my birthday on Jan. 7. This year, for several reasons, it stayed up until last night. But I definitely enjoyed the extra days of the decorated, lit tree. 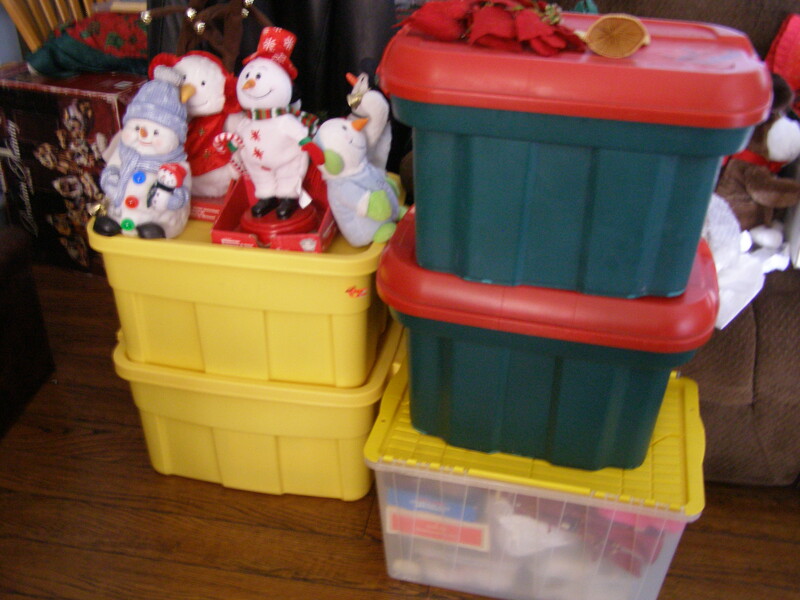 This year we are trying to downsize – and Christmas decorations is one area I must do so. I have 12 tuubs of Christmas decorations – for example: 2 tubs of ornaments, one tub just of angel ornaments, 2 tubs of house decorations, a tub of pillows and stockings. As I took the ornaments off the tree, I once again reflected on where we’d gotten them and why or if I loved them. If I didn’t love it, I put it aside. By the end of the process, I had two bags of ornaments to give away. Now over the next few days, I will sort through all the tubs. There are so many keepsakes though – my children’s crafts, my mother-in-law’s special projects. These will go into the attic for safe keeping. Christmas has lasted just a little bit longer this year! I am already taking part in ROW 80, the writing challenge that recognizes that everyone has a life, but provides support with accountability. For 80 days, there are twice weekly check-ins. Check here for my first check-in with this round’s writing goals. Ruth Synder is hosting a year long weekly blogging challenge. The first is to post your writing goals for the year. As I reread my ROW80 goals, I realized that my goals for the year stem from these. 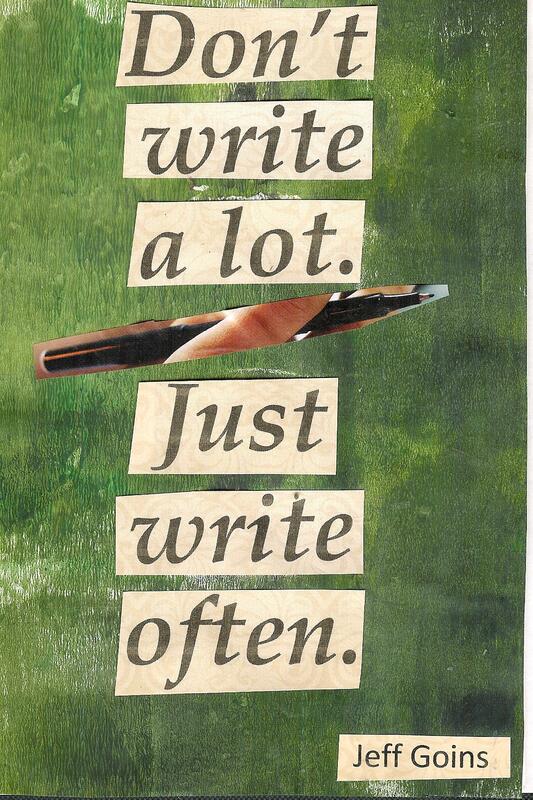 Write daily – at least 500 to a 1000 words a day. Take courses to improve my craft. Finish “Catching Fire” – first draft and edits and enter in Harlequin’s SYTYCW in Oct. Finish first draft of MG novel, edit/revise and submit. Write at least one picture book a month. Enter competitions and twitter pitch parties. Take part in 12×12 and Write1 Sub 1. Be sure to check here to meet other writers on this journey. It is just beginning.